"The happiest school in town!" Come and learn Ballet, Tap, Jazz, Singing, Street Dance and more from friendly, highly qualified expert teachers! Outstanding exam results, competitions, performance opportunities worldwide and at our regular Shows at the Alhambra, Bradford. Specialist training for Boys including boys only Streetdance on Wednesdays at 4:30pm, and regular classes with male teachers. 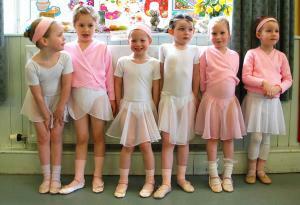 R.A.D and I.S.T.D Ballet, Free Trial sessions and discounts/scholarships available. Warm "family" atmosphere! Come and see for yourself! Come to our next Shows on Saturday 12th May 2012 at the Kings Hall Ilkley, or drop in to the Operatic House, Leeds Road, Ilkley any afternoon between 4pm and 7pm, or Saturday 9am till 1pm. Classes also held in Burley in Wharfedale! Mondays from 3:30pm at St Mary's Parish Centre, Station Road (opposite the Co-Op) Please call for details or come along any Monday!